Address: 39 Gia Ngu street, Hoan Kiem District,Ha Noi City, Vietnam.. Whether it’s for vacation or for abusiness trip, selecting the right Hotel makes all the difference. Advantageously located in the heart of the charming old quarter of Hanoi; countless tourist attractions, Government and Diplomatic institutions as well as the Business District of the city. Le Foyer Hotel, with its 30 well-appointed exclusively designed rooms, makes the Hotel the preferred choice of the demanding traveler as well as the discerning businessman. Lefoyer Bar & Restaurant offers all day dining and relaxing on the top floor, tt's so romantic and cool sight seeing Hoan Kiem lake, old quarter from the top view especialy at night! The hotel's staffs are well trained with high and professional skills. Training classes for staff with the principle of “maximizing the guests satisfaction by Good and Experieced Hospitality Leader". We will make you feel at home. 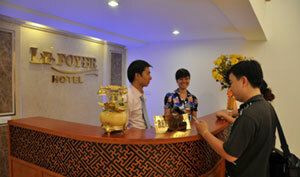 Lefoyer Hotel guarantees a comfortable stay with all luxury facilities within reach. 5 stars services at 3 stars prices. Come & enjoy your real trip in Hanoi! and modernly equipped, professional staff will help you have a pleasant and relaxation time! Is available to use. Please contact our front desk for more details. Thank you so much and we are here to serve you! Each of the rooms were well designed by one style with professional mixed colors.